With the recipients of this year’s MacArthur Fellowships having been announced today, there’s no better time to check back in on previous winners and see how they’ve put their prize money to use. 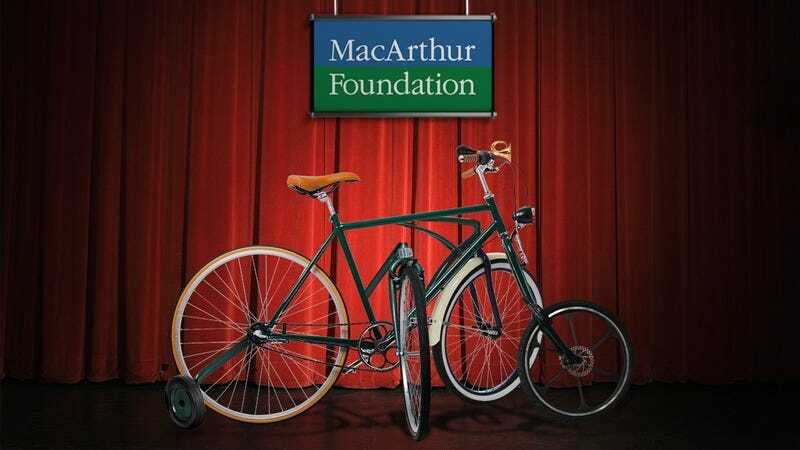 Amazingly, the 23 brilliant minds who took home the prestigious grant last year already proved just what can be accomplished when we invest in genius: The 2016 MacArthur Fellows have unveiled the five-wheeled bicycle they invented together with their grant money. Incredible. Let’s be honest, did we expect anything less from MacArthur ‘Geniuses’? The 2016 class of fellows gathered on stage at the John D. and Catherine T. MacArthur Foundation in Chicago this morning to present a five-wheeled bike they created as a group, which they’ve named the Fivecycle. After pooling all of their stipends, amounting to more than $14 million, the team began working year-round on the bicycle, each putting their expertise to work on different facets of its design, such as the alarm clock screwed onto the handlebars, its lack of a seat or pedals, and the holographic Bob Marley sticker on its frame. Although the group ran $8 million over its original budget, the hard work of geniuses like geobiologist Victoria Orphan, who had the idea to fill the five tires of the bicycle with sand instead of air, has clearly paid off. One MacArthur recipient, Subhash Khot, a theoretical computer scientist, was hardly able to contain his pride while explaining that one of the bike’s five wheels cost $300,000 and doesn’t spin at all, to which the audience responded with a standing ovation. Last year’s fellows also consulted winners from years past, such as author Ta-Nehisi Coates, a 2015 MacArthur recipient responsible for suggesting that the bike have a small cage with a caterpillar in it on the part of the frame where a water bottle holder would normally be. With so many bright people working together as one brain, it was all but guaranteed that they’d end up with an accomplishment of this scale. Truly, this invention represents the MacArthur Foundation’s goals and purposes at their finest. Their board of directors must be beaming with pride to see their investment pay off like this. No doubt, 2017’s Fellows have a huge bar to clear if they want to live up to the achievements of their predecessors. If this five-wheeled bike is any indication of the confidence MacArthur has in selecting its winners, we’re sure they will!